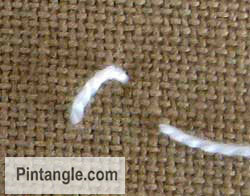 Sword stitch is a simple easy stitch to work which is classified as an isolated stitch. Its simplicity means your experiments can take you in different directions. Obviously you can work Sword stitch as an isolated stitch but arranging it in patterns or lines can take the stitch off in anther design direction entirely. You can flip them and worked them back to back or double and layer them. You can work Sword stitch in a circle to create ‘flower’ or marine life type shapes and motifs or work the cross with a bead threaded in the last part of the stitch. You can also mix your threads while working Sword stitch creating interesting contrasts of colour and texture in the process. 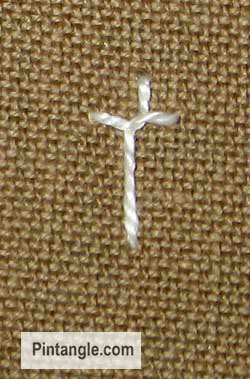 Its very simplicity of Sword stitch enables much and you are only limited by your imagination. 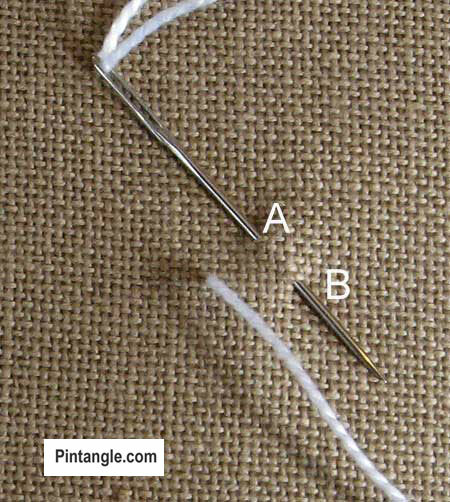 Bring your thread from the back of the fabric and insert your needle at A and bring your needle out at B. 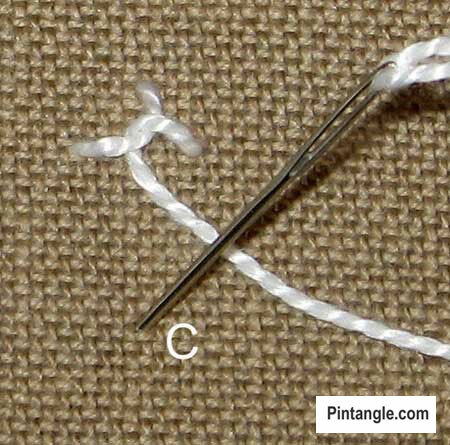 Pull your needle through to make a diagonal stitch. 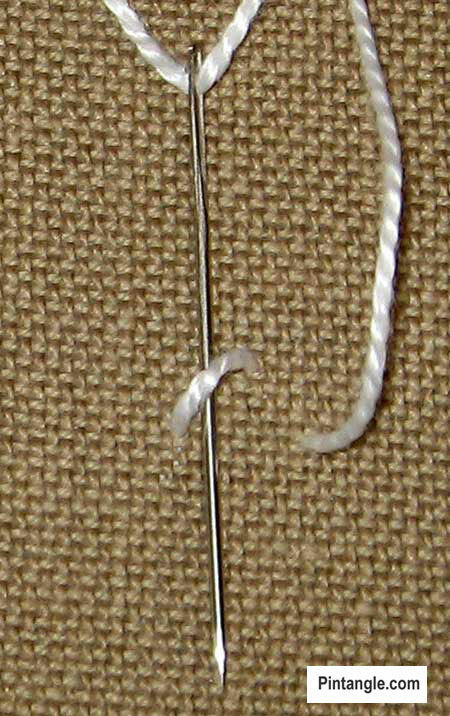 Keep your thread loose. As you can see sword stitch is simple but has many possibilities! You can have Pintangle delivered to your inbox by using the ‘follow’ feature in the sidebar. Just enter your email address, and when you get the confirmation email make sure you click ‘yes’ and you are all set! If you are on a mobile or tablet you will need to scroll to the bottom to find the ‘follow’ feature. I have posted the trials of Sword stitch in my blog and Flickr group. Had some fun with both of these. had a difficult time being inspired by this one but i gave it my best shot. Thank you very much Sharon..it is so nice to hear from you..you made my day too…really while stitching the sword stitch I remember all the good time I spend learning with mom..if there were no repair work at home I could have made some more better patterns..
My sword stitch sampler is posted on Flickr http://www.flickr.com/photos/38196082@N05/4740436541/in/pool-56846286@N00. Hi Sharon I have done my Sword Stitch sample and it is on my blog but I wouldn’t waste your time checking it out because it isn’t one of my best. Go pull some weeds out of the garden instead at least it will give you a small amount of pleasure. I am early too!!! you can see my trial on Flickr taste site! 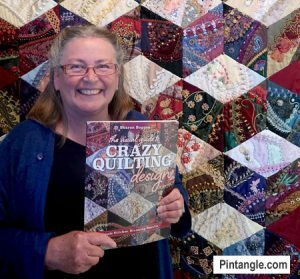 I am catching up slowly but surely..having a blast with all these stitches…I thought I might be too set in my ways to learn something new but I am learning. Thanks Sharon. here is my trial of sword stitch.. I have put french knots between the sword stitches.